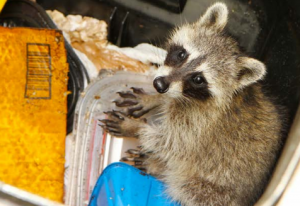 Question: How do I properly relocate raccoons from my attic? I have raccoons in my attic. Before I evict them, I want to provide an alternate place for them to go. There aren’t really enough trees around here anyway, so I want to make a raccoon house or two. Do you have any plans you could recommend? Also, in order to deter them from trying to get back in, is it true that they dislike wire/hardware cloth, and so I could reinforce those areas with that on the outside? They shouldn’t be pregnant yet, should they?